Tangelos are famous for their sweet, delicious juice. They are a cross between tangerines and grapefruits. The Honeybell a.k.a. Minneola Tangelo is one of the most popular varieties. Fruits first appear in December and will ripen in January and February. Tangelos have that citrusy, tangerine taste, and are extremely easy to peel. 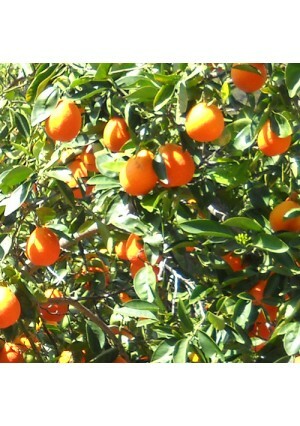 Tangelos can be grown outdoors in USDA zones 9 - 11, or as a container-grown tree in other regions of the U.S. if brought indoors for the winter. Honeybell Tangelos have a tart, tangy, sweet tangerine taste, and are very juicy. A mix of sweet and sour flavor of the sweet mandarin and the tart flavored grapefruit.